Paleontologist Li Chun at Institute of Vertebrate Paleontology and Paleoanthropology (IVPP) and his research team, reported a new genus and species of archosaur, Diandongosuchus fuyuanensis, a Pseudosuchian reptile, from the Middle Triassic Zhuganpo Member (Ladinian) of the Falang Formation in Fuyuan County, eastern Yunnan Province, China, according to a paper published in the September 2012 issue of the Journal of Vertebrate Paleontology. The Archosauria, the crown group of the traditional 'archosaur' clade, originated in the Early to Middle Triassic and consists of dinosaurs, including birds, pterosaurs, and crocodylomorphs. Its early members were long considered to live in terrestrial ecosystems until the discovery of Qianosuchus from the Middle Triassic (Anisian) marine Guanling Formation of Guizhou, China, which is semiaquatic and clearly demonstrates adaptation to a marine ecosystem. The new specimen is a nearly complete skeleton with most of the caudal vertebrae missing. 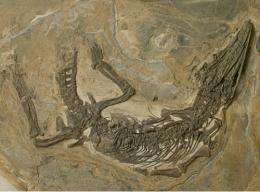 It is embedded in a slab of clay-limestone and much of the right lateral side of the skeleton is available for examination, except for the trunk, which is exposed in ventrolateral view, showing the gastralia and stomach content. The preserved length of the specimen is about 97 cm and the length of the body (from the last sacral vertebra to the snout tip of the skull) is about 77 cm. The specimen may have reached a total length of 155 cm in life if the tail length occupies 53% to 54% of the total length as in the extant Alligator sinensis. D. fuyuanensis is a pseudosuchian on the basis of the crocodile-normal tarsal joint and other features, such as the distal end of the ulna in posterolateral view squared off, osteoderms with a distinct anterior process, the presacral vertebrae dorsally covered by more than one osteoderm, dorsal osteoderm alignment dorsal to presacrals 10–24 staggered, the pubis-ischium contact reduced to a thin proximal contact, and the medial contact of the ischia extensive but the dorsal margins separate. The Falang Formation is thought to represent a sequence of sediments deposited in a shelf sea during the Ladinian on the basis of its lithology and invertebrate fossils. Besides the diverse fish fauna and the terrestrial protorosaur Macrocnemus, various marine reptiles such as nothosaurs, placodonts, pachypleurosaur-like animals, pistosaurs, some protorosaurs, and thalattosaurs are known from the Zhuganpo Member. D. fuyuanensis is from a marine deposit but shows few morphological adaptations of the postcranial skeleton for a semiaquatic way of life when compared with Qianosuchus from the Anisian limestone of the same area. However, the relatively posterior positioned external naris, the ornamented skull roof elements, and the large number of the premaxillary teeth are not common in fully terrestrial archosaurs, but are seen in Qianosuchus, Chanaresuchus, and the spinosaurid dinosaurs, which were considered to be semiaquatic. 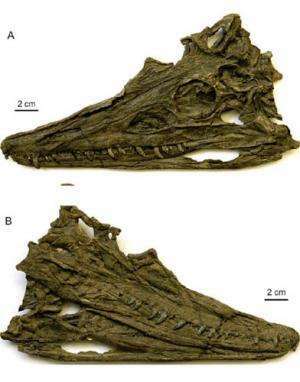 As to the skull ornamentation, the pattern of pits, short grooves, and ridges does not resemble the fine elongate ridges and grooves seen in Qianosuchus and other Triassic marine reptiles such as thalattosaurs and nothosaurs, but is more comparable to that of marine crocodyliforms (especially with respect to the ornamentation of the mandible) such as Terminonaris and the Tomistominae. "These skull features suggest that Diandongosuchus might have had a lifestyle similar to phytosaurs or recent saltwater crocodiles, living near the water and adapted for an amphibious way of life. In addition, such a way of life for Diandongosuchus may be further inferred from its stomach content that includes fish remains", said Dr. Xiao-Chun WU, corresponding author of the study, Canadian Museum of Nature, Ottawa. A phylogenetic analysis derived from an existing data matrix suggests that the new archosaur occupies the basal-most position in Poposauroidea and further confirms the poposauroid status of Qianosuchus. On the basis of current information, the discovery of Diandongosuchus does not firmly underscore the affinity of the semiterrestrial vertebrate faunas between the eastern and western regions along the northern coastline of the Tethys. This work was mainly supported by research grants from the National Natural Science Foundation of China, and the CAS/SAFEA International Partnership Program for Creative Research Teams of China.